Maruti has started a new innings of the Alto K10 nameplate with a brand new car replacing the decade old predecessor. Apart from its new outfit and interiors, the pinnacle of this launch is the incorporation of the AMT - Automated Manual Transmission in the K10 which Maruti calls - AGS, Auto Gear Shift. The vehicle will compete majorly with the Hyundai EON 1.0L along with the Datsun GO. 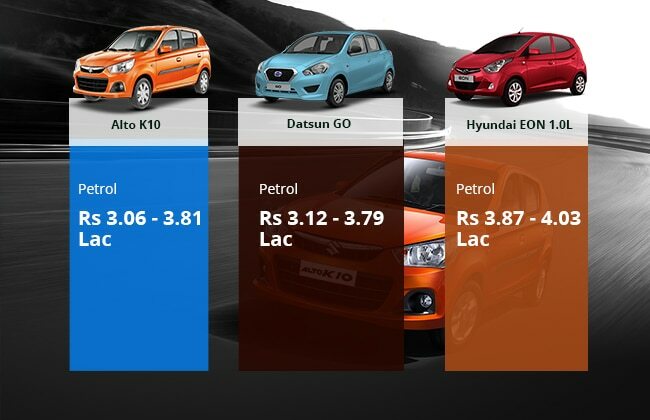 Its lighter, cheaper than before and we all know it has an added advantage of an AMT gearbox but lets see how on paper the new Alto K10 fights back with its Korean and Japanese rivals. 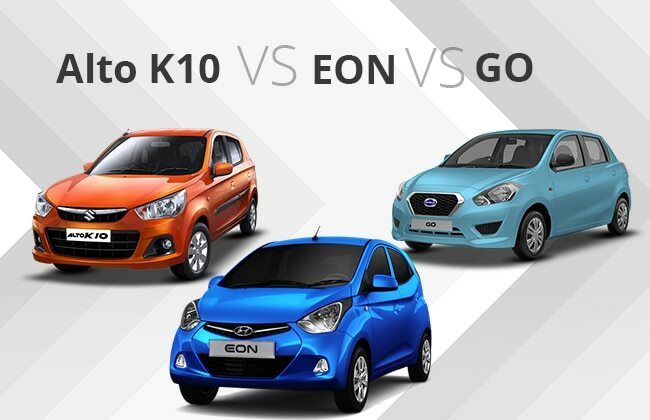 The previous gen Alto K10 always lost on its decade old looks when compared to its modern rivals EON and GO. But this time Maruti has given a complete overhaul to the entry-level hatch, a more modern design which turned out to be a grown-up Alto 800. Now, on the design front, all the three cars offer swept back taillamps but both Hyundai and Maruti have sleeker grilles while GO gets Datsun’s signature large inverted trapezoidal grille. Talking about the rear, Alto K10 gets 800 inspired lamps while EON’s features christmas-tree-esque lamp and probably the only car here to offer dual-stop lamp. Datsun GO offers simple and conventional rear look. Like the exteriors, Alto K10 offers massive improvements to the interiors, though the exteriors of the previous gen K10 were acceptable, it were the interiors that looked dated the most. The 2014 Alto K10 offers a new dual tone dashboard; offering in-dash audio unit with AUX-in, USB, CD and tuner. EON on the other hand offers the nicest looking dash of the lot, audio unit is 2-din featuring CD/MP3, AUX-in, USB and tuner. Talking about the Datsun, GO gets dashboard inspiration from its premium sibling Micra. On the audio front, unique-to-the-Datsun - Mobile docking station offering AUX-in and charging options is available. All the three cars offer only petrol engines. Datsun here offers bigger displacement engine amongst the two, a Nissan derived 1.2 liter unit belts out 67.1bhp of max power similar to the rest two but its the only hatch here that offers 3 digit torque figure - 104Nm. The motor in GO is mated to a five-speed manual unit. 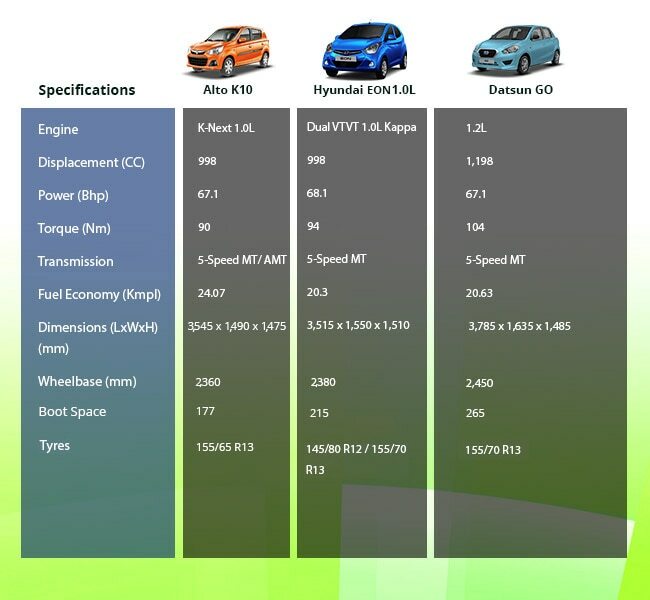 Hyundai has recently put in 1.0 liter dual Kappa VTVT engine in the EON range, earlier it was only available with a 0.8 liter iRDE motor. 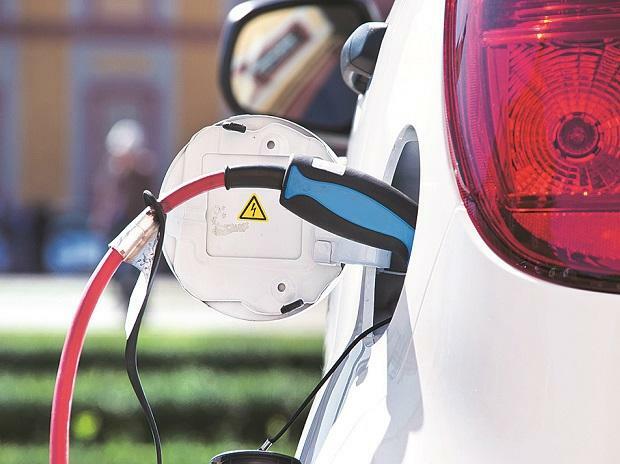 EON chucks out 68.1bhp and 94Nm of max torque and is mated to a five speed manual box.